The Incubator initiative is a collaborative project between dance Immersion and North York Arts (NYA), offering dance artists an opportunity to explore, redevelop or complete a work in a supportive structure that provides access to the North York Arts Upper Gallery and Studio Theatre. Do you have a dance work that is ready to be explored, developed, and refined? OR a work in progress ready for more development? The Incubator initiative is designed with a focus on having the freedom and additional time for exploration, rehearsal and revision, with an opportunity to enhance presentation skills in a professional venue. This residency includes 75-hours for creation in studio, followed by 3 days in the Studio Theatre. This incubator also includes 4 hours of administrative support from dance Immersion, plus 4 hours with an outside eye of your choice, who will assist with the artistic development of the work. Application is open to dance artists who have a work that is ready to be explored, redeveloped, refined or a work in progress that needs more time for development. 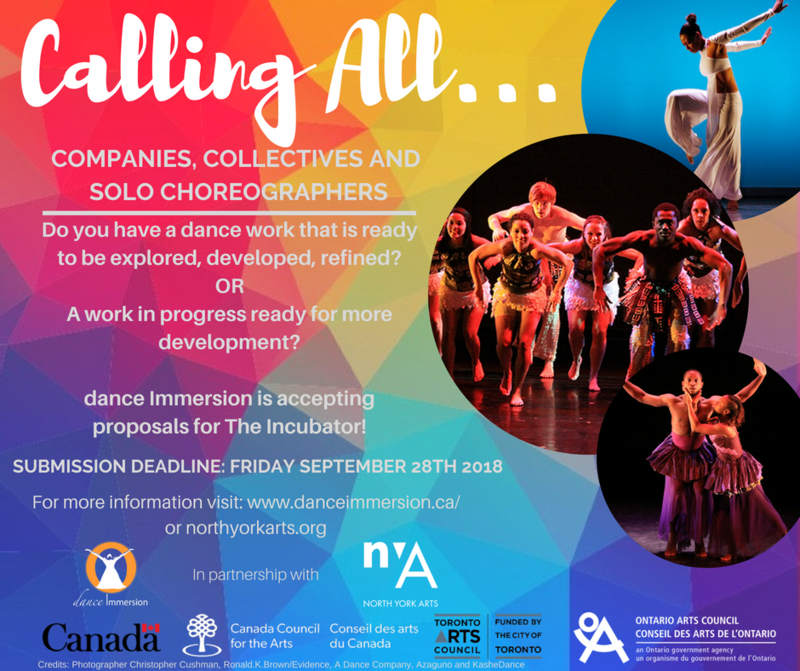 It is mandatory that you submit your application and support material via Dropbox or WeTranfer to incubator@danceimmersion.ca before midnight on Friday September 28, 2018. Support material must be submitted in video, JPG or PDF format. After all applications are received and have met the eligibility criteria, applications will be reviewed by a committee who will make the final selection. Artist/group will be notified by November 19, 2018. North York Arts is a non-profit and registered charity. North York Arts (NYA) is one of six Local Arts Service Organizations (LASOs) in Toronto whose purpose is to deliver on the City’s social, economic and cultural goals outside of the downtown core. NYA was created to specifically address the needs and interests of artists, arts organizations and residents based in North York. An inclusive, engaged, and sustainable arts and culture community in North York.